After few early bumps, the Pakistan Stock Exchange managed to stand its ground to end the last session of the week with gains. Foreign investors continued to offload stocks worth $2.28 million on Friday. 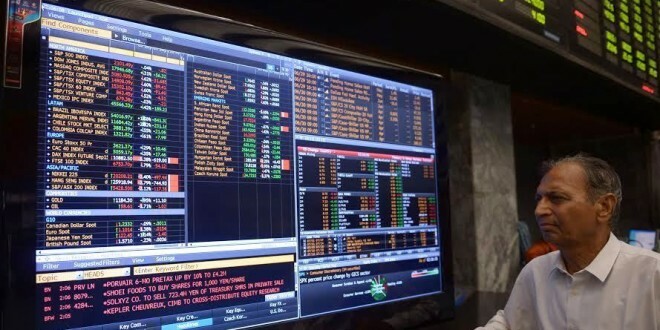 The positivity came on a media report that the policy board has decided to formulate a stock market fund to boost the investors’ confidence. The fund would reportedly be handled by multiple state-owned institutions together. According to the latest data released by the State Bank of Pakistan, foreign exchange reserves fell by 2.1pc on a weekly basis and stood at $10.3 billion. The decline was due to external debt servicing and other official payments. After shedding a few points in the early hours of trading, the KSE 100 index benchmark gathered 633.28 points to reach an intraday high of 37,420.92. It closed positive at 37,337.87 after gaining 550.23 points. The KMI 30 index accumulated 1,088.67 points to end at 61,038.90, while the KSE All Share index surged by 335.02 points to end at 27,405.34. Out of total traded scripts, 253 advanced, 63 declined while the value of 15 remained unchanged. The overall trading volumes improved by 32pc and were recorded at 189.15 million. The Bank of Punjab (BOP +7.08pc), Unity Foods Limited’s right shares (UNITYR1 +8.89pc) and K-Electric Limited (KEL +3.56pc) topped the volume chart. The scripts had traded 22.80 million shares, 20.83 million shares and 14.84 million shares respectively. The vanaspati and allied industries sector (+6.57pc), refinery sector (+5.30pc), transport sector (+4.99pc), engineering sector (+4.90pc) and cement sector (+4.11pc) ended with major gains. On the other hand, woolen sector (-2.74pc), jute sector (-1.70pc), synthetic and rayon sector (-1.56pc) and close-end mutual fund sector (-1.33pc) closed the session as losers. Attock Petroleum Limited (APL -5.00pc) declared its financial performance for the third quarter of FY19. The company’s sales improved by 8pc on a YoY basis, while its earnings per share declined from Rs14.60 in the same period last year to Rs2.86 in the current year. Security Papers Limited (SEPL +5.00pc) also announced its financial results for the third quarter of FY19. Sales inched up by nearly 4pc on a YoY basis, while earnings per share dipped from Rs5.21 in the same period last year to Rs3.76 in the current year.